The Oakmark Intl Small Cap (Trades, Portfolio) Fund, part of Harris Associates, released its fourth-quarter 2018 portfolio last week, listing three new holdings. Warning! GuruFocus has detected 5 Warning Signs with MIL:PIRC. Click here to check it out. Managed by David Herro (Trades, Portfolio), Michael Manelli and Justin Hance, the Chicago-based fund seeks long-term capital appreciation by investing in foreign, small-cap companies that are trading at a discount to its estimate of intrinsic value. Based on these criteria, the fund established positions in Pirelli & C. S.p.A. (PIRC.MI), Kimberly-Clark de Mexico SAB de CV (KIMBERA.MX) and Bucher Industries AG (BUCN.SW) during the quarter. The fund invested in 2.02 million shares of Pirelli & C for an average price of 6.17 euros ($7.01) per share, dedicating 1.04% of the equity portfolio to the stake. 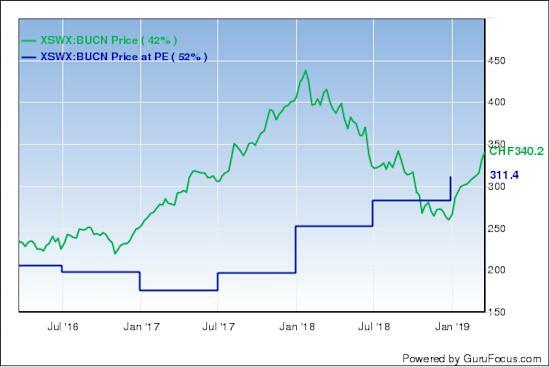 The Italian tire manufacturer has a market cap of 5.97 billion euros; its shares closed at 5.97 euros on Monday with a price-earnings ratio of 45.92, a price-book ratio of 1.36 and a price-sales ratio of 2.27. Pirelli's financial strength and profitability and growth were both rated 5 out of 10 by GuruFocus. Although the company has issued 2.4 billion euros in new long-term debt over the last three years, it is at a manageable level due to adequate interest coverage. The Altman Z-Score of 0.82, however, warns the company is in danger of going bankrupt. Although the operating margin is in decline, it still outperforms 99% of competitors. The company's returns, however, underperform industry peers. Pirelli also has a moderate Piotroski F-Score of 5, which indicates operations are stable. The business predictability rank of one out of five stars is on watch as a result of declining revenue per share and a loss in operating income over the last several years. According to GuruFocus, companies with this rank typically see their stocks gain an average of 1.1% per year. With its purchase of 0.20% of outstanding shares, Oakmark became the company's largest guru shareholder. The Signature Select Canadian Fund (Trades, Portfolio) also owns the stock. 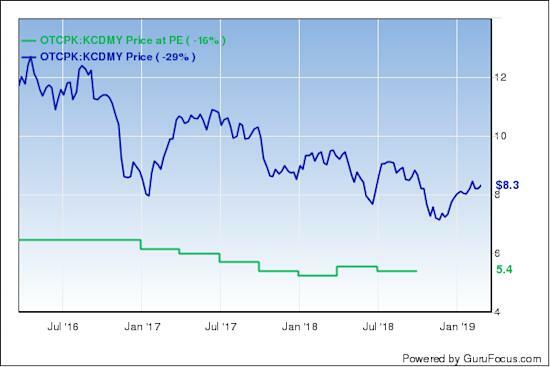 Oakmark picked up 5.7 million shares of Kimberly-Clark de Mexico for an average price of 30.49 pesos ($1.60) per share, allocating 0.72% of the equity portfolio to the stake. The Mexican company, which is a subsidiary of consumer goods giant Kimberly-Clark Corp. (KMB), has a $5.13 billion market cap; its U.S.-listed shares (KCDMY) were trading around $8.32 on Tuesday with a price-earnings ratio of 23.39, a price-book ratio of 24.59 and a price-sales ratio of 2.51. As a result of issuing approximately 3.5 billion pesos in new long-term debt over the last three years, GuruFocus rated Kimberly-Clark de Mexico's financial strength 5 out of 10. Despite having low interest coverage, the Altman Z-Score of 3.44 suggests the company is in good fiscal health. The company's profitability and growth fared much better, scoring an 8 out of 10 rating. Although the operating margin is in decline, it still outperforms 89% of competitors. The consumer goods manufacturer is also supported by strong returns that outperform industry peers, consistent earnings and revenue growth and a moderate Piotroski F-Score of 6. The company also has a four-star business predictability rank. GuruFocus says companies with this rank typically see their stocks gain an average of 9.8% per year. After selling out of Bucher Industries in first-quarter 2018, the International Small Cap Fund purchased a new 32,000-share holding for an average price of 276.01 Swiss francs ($276.18) per share. The trade had an impact of 0.68% on the equity portfolio. The Swiss company, which produces a wide range of machinery, vehicles and industrial systems for agriculture, automation and manufacturing, has a market cap of 3.47 billion francs; its shares closed at 340.2 francs on Monday with a price-earnings ratio of 16.39, a price-book ratio of 2.37 and a price-sales ratio of 1.13. 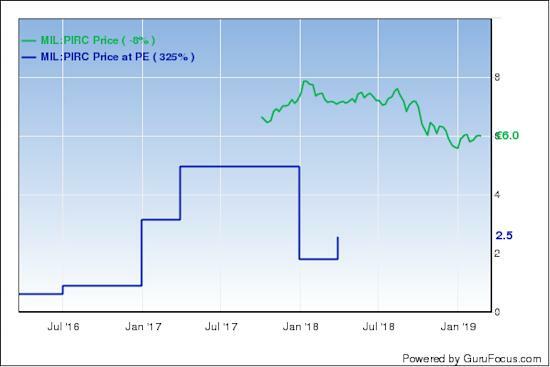 Based on the Peter Lynch chart below, the stock appears to be overvalued. Bucher's financial strength was rated 7 out of 10 by GuruFocus, driven by comfortable interest coverage and a robust Altman Z-Score of 3.43. The company's profitability and growth scored a 6 out of 10 rating. Although the operating margin is in decline, it still outperforms 61% of competitors. Bucher is also supported by strong returns, a moderate Piotroski F-Score of 5 and a one-star business predictability rank. The fund holds 0.31% of outstanding shares. During the quarter, Oakmark also boosted its holdings of ConvaTec Group PLC (CTEC.L), Sulzer AG (SUN.SW), Outotec Oyj (OHEL:OTE1V), Ansell Ltd. (ANN.AX) and Hays PLC (HAS.L). The fund's $1.25 billion equity portfolio, which is composed of 57 stocks, is largely invested in the industrials sector. According to its fact sheet, the International Small Cap Fund posted a -23.73% return for 2018, underperforming the MSCI World ex. U.S. Small Cap Index's return of -18.07%.